Well kids, I have good news and bad news. Good news? To the best of my knowledge, no one was raptured away this weekend. The bad? The Padres are in the cellar and we are forecast for yet another week of unseasonably cool and drizzly weather. I AM RUNNING LOW ON WAYS TO MAKE SOUP, PEOPLE. 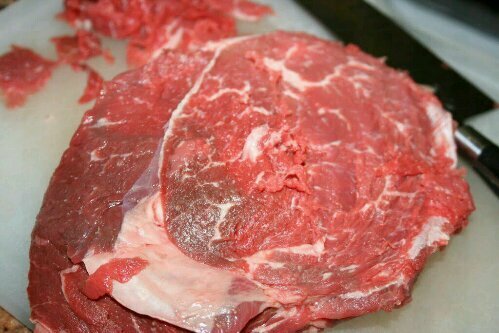 Lucky for me, I was poking around the web yesterday and came across a New York Times article by Jane Sigal on shaved steak. Any fan of beef in brodo, shabu-shabu, or phở will recognize this razor thin cut of beef that cooks almost instantly when dropped into hot broth. The extreme thinness of the meat not only makes it a snap to cook, but also keeps the meat ultra tender while frugally adding tons of body to a simple soup. As Sigal points out, this is a very forgiving cut and a good choice for a novice home cook – “foolproof,” in fact. Having made this at home, the meat does come out remarkably tender and with a lot of volume for a small amount of meat.